Manitoba's small town hotel bars seem to be going the way of Britain's local pubs. The Winnipeg Free Press's Bill Redekop tours a pile of the hotels I once attended in Southern Manitoba. When an opportunity arose to buy the Notre Dame Hotel, he liked the idea of being his own boss and took the plunge. Despite five banks turning down his request for a mortgage on the old hotel, which started out as a men-only beer parlour a century ago, Mondragon was energized. The beverage room is in the centre of town, and seemed to have decent traffic. It seats 50 but can hold 80. It also had a restaurant and beer vendor. The town has a population of about 600, with another 400 on its periphery. His first year, he reinvested $30,000 into upgrades including a new musical sound system. Mondragon threw street parties, costume parties, theme parties, formal gown parties where women wriggled into their old wedding gowns for a night, light'n' bright parties (neon spandex wear), pyjama parties, toga parties and brought in musical acts. The events were good but they should have supplemented his income, not been his life support. He hired an expert chef and expanded the restaurant hours, even offering 6:30 a.m. breakfast. He lost money every month but one. He finally closed the restaurant, something that's still a sore spot with people in town. The beverage room now doesn't open until 12:30 p.m. and he's had to cut staff and increase his own hours. After four years, he has yet to take a paycheque. "You burn out. If you're working for nothing, you're motivation goes fast," he said. But is the rural beverage room worth saving? Gary Desrosiers drives a school bus but not for kids. Desrosiers has owned the Brunkild Bar and Grill on Highway 3, about half an hour southwest of Winnipeg, for 16 years. With all the changes to liquor laws -- from banning smoking to tougher drinking and driving laws -- he knows people are shying away from beverage rooms. After all, if you lose your driver's license, you can lose your ability to earn a living, especially in rural areas. And it's not as though people can call a taxi or take a bus to get home. Well, they can at the Brunkild Bar and Grill. Years ago, Desrosiers bought a bus and began transporting people to and from his bar. His bus service picks up people from Winnipeg to Carman, and all points in between. He then drops them off again at the end of the night. He's on his third bus. It holds 30 people but most times he carries from 15 to 20. The bus goes out once or twice a month to pick up some group or other. Sometimes it's University of Manitoba students from faculties like education or agriculture, such as when the aggies hold their "drink the town dry" events. He'll get a call from people who are bored at a house party, and bus the entire crew to his beverage room. Desrosiers only charges for fuel but that can run about $100 for his old gas guzzler built in 1979. While transporting patrons, he's also picked up stranded motorists. He once picked up a family -- parents and three children, including an infant -- on a lonely stretch of highway after 2 a.m., in bone-chilling cold, and brought them back to his beverage room. The bar as refuge? That's exactly what it is, said Desrosiers. Where do you want people drinking? he asks. He doesn't wait for an answer. "The bar is the safest place. You have sober, experienced people to look after you. How many people are murdered in a bar versus murdered at a drinking party? I literally, under the law, have a duty of care." Desrosiers acknowledged there isn't much sympathy among the general public for beverage room owners. But one of the effects of tightening government regulations on rural hotels is people have begun converting their garages into little private bars and having crowds over. The garages are insulated and furnished, and people can smoke and drink liquor at retail prices. Tough business. Rural population decline, and rural ageing, doesn't help; that likely explains tough times in Mariapolis. I'm told Notre Dame, though, is in better shape than it was 20 years ago. The smoking regs may have done some of it. I wonder if anybody's there looked at the data on local pub custom and the change in the drink driving limit from .08 to .05. We always had a designated driver, but the increment from .08 to .05 could be chilling. It's pretty testable: if it's the drink driving limit, you'd expect a differential effect on bars serving lower population density catchments with the change because required driving distance to get to the pub would be longer. Our farm was seven miles south of Notre Dame on PTH 244. I spent a bit of time at that hotel. A correspondent tells me that this flyer's been showing up in mailboxes around Herne Bay. The right to object to neighbours' putting up a 4-story building that "steals daylight, privacy, perhaps views, and devalues your property". Some of this is legitimate; a process that facilitates Coasean bargaining with truly affected neighbours would be better. The right to have ample on-street parking available whenever you might want it. Unless they've bought an easement from Council providing guaranteed spots in front of their houses, this is no more a right than having an unconstrained commute with no traffic. Pragmatically, this stuff should be handled by putting in time limits on parking on residential streets with exceptions for those with residents' passes. Hand out two per house and let them on-sell them if they want. The right to have the neighbourhood look as it always has looked. Again, unless they've gone and purchased easements from the neighbours preventing substantive changes to properties, there's no right here. The right to change how your house looks, even if some other people who don't own your house don't like that anything anywhere ever changes. The right of others to join together buy a property on the street with their own money, from a willing seller, and to put up townhouses to live in. The "If you think your home is your castle, think again!" line is a howler. If it's my castle, I can paint it purple and change the front gate without getting resource consents even if the Herne Bay Residents Association Incorporated doesn't like it. The Key government is rushing some counter-terrorism legislation through Parliament under urgency. There's one day to make submissions on legislation too complicated (for me) to understand in one day. And the CAPTCHA is broken on the Parliamentary website, preventing online submissions. Note the input-error line at the bottom of the clip below, HT: Farrar. Remember Helengrad? What should we call this? Today's must-read: Richard Diver's entrepreneurial approach to the Christchurch rebuild. After the Christchurch quakes, City Council locked down the downtown in endless planning. Then central government didn't like Council's plan and put in the CCDU instead: not really an improvement, although at least they backed away from daft light rail plans. It is true that more than anyone else, Diver has been disrupting the tidy plans of the bureaucrats by throwing up buildings faster than they can blink. They had this lumbering Blueprint plan for the city core. But Diver has raced ahead, populating Victoria St with 10 office developments in quick succession - half of them now open, half on the go - creating his own alternative CBD on the city's northern corner. No doubt Diver soon became a problem for the official rebuild - the Blueprint masterplan drafted by the Christchurch Central Development Unit (CCDU), the specially set-up arm of the Canterbury Earthquake Recovery Authority (Cera). Small-scale redevelopment in Victoria St was fine. But the grumble became that Victoria St was being allowed to run riot, siphoning money away from where the government plan wanted it to go. There were mutterings that Diver's buildings were cheap and temporary. He might have his A-grade tenants for a few years, but they would shift down to the classier city core eventually. Diver laughs. There are some good-looking buildings out there. And the tenants have been investing millions on the interiors. "The amount of money they're spending on the fit-outs, they're not moving in a hurry." It was another blow to the CCDU when high-flying software firm Telogis took the top four floors of 104 Victoria St, Countrywide's refurbished ANZ building. The Blueprint has a designated innovation precinct over on the CPIT side of the city. But it is happening too slowly. Meanwhile Victoria St is fast returning to life, abuzz with bars and restaurants. Read the whole thing. Really really great stuff. As Christchurch waited for something constructive to happen behind the barricades, it became evident that Sutton was not Superman and Cera was just another bureaucracy. But he could still talk the talk and clearly enjoyed his celebrity. Rather than restore life to the city centre as quickly as it could, Cera was demolishing most of the remaining buildings. It saw the city central as a blank canvas for civic planners to design what they pleased. Not long before they issued their "blueprint" a group of out-of-town media were invited by Earthquake Minister Gerry Brownlee to see the progress. Sutton joined us for coffee in the delightful little mall of shipping containers that private enterprise had created amid the demolition cranes and debris. I expressed disappointment at the wider sceneand he replied with a sarcastic reference to the design of downtown Auckland. He didn't seem accustomed to criticism, he was used to being admired. Maybe he'd have liked Queen Street's aesthetics better if they there ran Visible G-String Fridays. It's taken three years, but I think most folks are now on about the same page on the Christchurch debacle. Hopefully this kind of approach is never ever repeated. Andy Williams reckoned “Christmas is the most wonderful time of the year.” Yet while a fine singer he was no economist and so at this event two teams will debate the lessons that economics provides on this season. I didn't express a preference for either side on this one; I'm to be arguing in the affirmative. Since I'm contrarian, and since the horrible inefficiency of Christmas is now well-established, it would have been perhaps more fun arguing for the efficiency of Christmas. I'll endeavour to go a bit beyond the usual deadweight-cost inefficiency arguments in making the case against Christmas. Explaining Daddy's day at work to the kids will be even more fun than usual come 11 December. Previously: Coase and the Whos. The plain fact is, the country's security service got caught up in the political games of election 2011. Wilfully or accidentally, It became a political arm of the party in power and not, as it should be, a neutral government agency. Scary indeed. Read the whole thing. Not entirely convinced that the government really ought to be rushing through stronger powers for the security apparatus until they've sorted out perhaps a few better control mechanisms preventing partisan use of the security apparatus. We could argue about the ridiculousness of the implementation of the New Zealand regime, or we could ask the more important question: why does this office [Office of Film and Literature Classification] exist at all? Why does a country of four and a half million people have an office for film classification when so many neighbouring countries, similar to New Zealand in culture and norms, already have their own systems? Every rating decision involves cost to the would-be distributor: the classification fee charged by the Censor’s Office, plus the hidden cost of the time, effort, and hassle involved. In a better world, the government could simply require that programmes distributed in New Zealand carry the classification of any other trusted country’s ratings board: Australia, Canada, America, the UK, or others. It’s pretty rare that a locally produced film wouldn’t be intended for eventual international release; if the filmmaker weren’t already seeking an international classification, self-rating by the local producers could also work well. Worse, when a body like the Censor’s Office exists, local industry can use it to try to block competitors’ imports. Slingshot and other ISPs’ global-modes, allowing Kiwi customers to sign up for Netflix as though they were American, is just parallel importation applied to digital content. Local rights-holders supported the Censor’s Office attempts at blocking those services, with pious appeals to protecting the children from unrated content. We should properly see the Censor’s Office as a non-tariff barrier to trade in film and literature, which locals can exploit anti-competitively. New Zealand has rather a few of these local fixed-cost-raising regulations. If you’re a doctor with a stellar reputation in Canada, you still need to go through New Zealand registration; that requires placement in a New Zealand hospital, and placements are limited. Would you, as a tourist in Canada, be at all worried about being treated by a Canadian doctor in a Canadian hospital? No. But that same doctor cannot move to New Zealand and set up a General Practice without jumping through the hoops. Perhaps there could be reason for a short course training foreign physicians to recognise diseases prevalent here that aren’t as common elsewhere, but beyond that, the government’s increased the cost of medical services in New Zealand by imposing an unnecessary fixed cost on the system. Similarly, I simply cannot understand why building materials that have been deemed suitable for other wet and shaky environments, like Japan, British Columbia, or the American Pacific Northwest, aren’t simply deemed to be good enough for the New Zealand market as well. The TEU also notes that it isn't just the earthquakes but rather a re-focusing within the University: the proportion of full-time continuing administrative staff is up 16%. The number of administrators per academic has increased substantially as the number of academics has dropped. They report also that the ratio of full-time continuing academic staff to all staff has dropped substantially since 2012: if my algebra isn't wrong and their numbers are right, it's about 40% of what it was. Their figures look at the change since 2012. I know that the Economics Department was shedding staff very shortly after the September 2010 earthquakes: we lost two to Waikato really quickly. Those early shifts won't be in the TEU figures. Kudos to the TEU for putting this out. As I understand things, they represent both academic and administrative staff; I never joined partially because of worries that they did a bit more to protect the general staff against restructuring than they did to emphasise the academic side. That they're now noting the decline in academic staff as proportion of staff is significant. Whaleoil took aim at my former colleague John Gibson. John received a Marsden grant for some work looking at the elasticity of soda consumption to soft drink taxes. When I saw that John had received the grant, I knew he had to be up to something really interesting, so I dropped him a note asking about it. He told me that a lot of current estimates of the effects of taxes on consumption are confounded by that we use data on total spending as a proxy for consumption, and where consumers can substitute down a price/quality ladder with an excise hike, total consumption may be rather more inelastic than we might have estimated from data based on a consumer's change in spending after a tax: what can look like a drop in spending after a tax hike could be a maintenance of ex ante consumption at a lower price point. Interesting stuff indeed. I hadn't blogged on it yet due to the busy. I wish I had hit it earlier now that I see Whale went after John. I supposed Whale guessed from the project title that this would be another publicly funded attack on consumer freedom. John's project isn't that, as John later explained in a "right of reply" post. Good on Whale for posting it. Wellington Council's under fire for having consulted with bars when they were setting the Local Alcohol Policy. Police are calling foul over a deal they say was struck between Wellington City Council and Hospitality NZ to allow the capital's bars to stay open later. Internal council emails - obtained through court records this week - show many of the final details of the city's local alcohol plan were hammered out in a closed meeting with bar owners before it was opened to public submissions. They also show the council and Mayor Celia Wade-Brown were in regular contact with local Hospitality NZ president Jeremy Smith, including consulting him on strategies for avoiding Government-imposed closing times. The council has said it treated all "stakeholders" equally, and it also held meetings with police before the policy went out for public submissions. It is understood police are upset about the industry's involvement in forming the proposed rules. During a hearing on the policy last week, a police lawyer said the council pushed a "deal" with the hospitality industry before the public had their say. Much of the Dunedin City Council's plan seems to stem from the police, which proposed a range of bans from midnight including that on liquor shots. Wellington's process seemed pretty inclusive. Greg O'Connor notes that the move to local alcohol policies would enable more local lobbying from the Hospitality Association; I disagree with him on the net effect here. On alcohol, you have producer lobbies, bars, the Hospitality Association, retailers (supermarkets and bottle shops), local anti-alcohol activists, national health lobbyists, national anti-alcohol activists, local doctors, local police and the national police structure. When policy is set nationally, the big producers can focus on one place: Wellington. It downweights the influence both of local pubs and retailers and of local anti-alcohol activists, but increases the influence of national-level lobby groups both for and against. It's harder for both local bars and for local activists to front at select committee hearings. When it's set locally, it's harder for the large national lobby groups to hit all the different local policies; they'd instead only bother with the big cities or smaller ones that might form test-cases, unless they have unlimited resources to present at each local body. That downweights the producer lobbies, increases the influence of local retailers and bars, increases the influence of local anti-alcohol activists, reduces the influence of national health lobbyists except to the extent that they are called as police expert witnesses, increases the influence of local doctors and local police, and increases the influence of national police relative to national producer lobbies as the national-level policing lobby will back up their local officers. On net, I think that tips things in favour of the pro-restriction side rather than the anti-restriction side. On evidence, that most Councils have pushed for earlier closing times than the national default also suggests that the antis have gained rather than lost influence. That Wellington has considered things other than just what Police want doesn't really change that. Disclosure: I was expert witness for the Hospitality Association on the effects of bar closing times. Adam Gurri provides a moral challenge to Paretean welfare economics. All this only works if you think one preference is just as good as another, and maximizing preferences is a wonderful goal for a moral philosophy. I, for one, think that this is a terrible goal for morality, especially taken in isolation. My favorite example of this model’s utter failure to provide a sufficient moral compass comes from the play A Raisin in the Sun. In it, an African-American family seeks to move to a predominantly white, affluent suburban neighborhood. You can probably guess where this is going: the people who already lived there did not want this family as their neighbors. From an economics point of view, the family was imposing an externality on their racist neighbors. What’s more, the real historical phenomenon of “white flight” in such cases actually reduced demand for housing in the neighborhoods that were being fled. As a result, the housing prices fell in the neighborhoods that African-Americans moved into, making the existence of a formally-defined externality undeniable. I challenge the committed Pigovian to explain to me how this is anything other than a clear-cut externality, and how they can avoid the conclusion that their model would have them impose a tax on the African-American family. Moreover, libertarians aren’t in a much better position, morally. In A Raisin in the Sun, we get to see an actual Coasian bargain in action—-the white neighbors pool their resources to offer to buy out the African-American family from the house. Without spoiling the plot, I can’t say that the fact that this is a voluntary bargain inclines me to believe that the preference of the bargainers are on equal moral footing. The philosophy of maximizing preferences does not distinguish between the family seeking the opportunity to rise above their circumstances and the racists who hate them. While I'm more than happy to condemn the racist neighbours, I don't think the example provides that strong a case against standard economics. The baseline is liberal: the African-American family is able to buy the house. The neighbours haven't been able to appeal to some notion of "neighbourhood character" to ban them from moving next door. Despite potentially high transactions costs, the neighbours were able to buy them out, indicating that their actual willingness to pay to be horrible racists was pretty high. Gurri suggests that the main policy conclusion would be "tax the African-American" family; Coase reminds us that Pigovean externality-taxation solutions are not the only way of enabling Paretean welfare economics, and that the direction of the externality is always a bit up for debate. We could equally note the substantial negative externality the racists place on the incoming family and tax them for it. And in this case the Coasean solution obtained without any policy imposition: the neighbours bought out the incoming family. I haven't read the play, but based only on the snippet above, I'd have written a Sylvester McMonkey McBean style conclusion: the outgoing family would tell their friends about these crazy racists who are willing to buy you out, at a premium, if you buy a house in their neighbourhood. Eventually, the entrepreneurs would drain the racists of any continued ability to pay for racism. And while I'll agree with Gurri that any of us coming from particular philosophical perspectives will have sets of preferences that they view as better than others' preferences, having something other than a Paretean set-up for policy requires picking winners among competing values. Even leaving aside the substantial problems Cowen points to in his chapter on non-Paretean welfare standards, we have another simpler, but important, issue. In the play, the neighbours had to demonstrate a real willingness to pay for racism. In the alternative, in which we move away from Paretean welfare economics, we need some voting apparatus to overturn willingness-to-pay and choice as basis for assessing whether a move has improved welfare. And racism is cheaper at the ballot-box than it is in the real world. It is far easier to imagine neighbourhoods being willing to vote for measures that would ban particular types of people from being able to buy houses, or lodging objections on notified consents, than it is to imagine their actually being willing to buy those people out. If actual willingness to pay is less than the amount necessary to change the outcome, then the externality is not Pareto-relevant. Where illiberal preferences are weakly but broadly held, overturning the results of voluntary choice through use of a non-Paretean framework risks intervening to address externalities that are not Pareto-relevant, with greater illiberalism as result. If, on the other hand, illiberal preferences were very strongly held among a very well-heeled minority, results could flip. The University of Otago's public health department has been pretty prominent in pushing for tighter alcohol regulations in New Zealand. But it's a little surprising that the University there would let that group near anything that might matter, like student enrolment figures. Here's The Wireless on Dunedin's proposed Local Alcohol Policy. However, [unlike the Students' Association] the University of Otago supports all the council's suggestions. It goes further in places, including to suggest that all alcohol sales in Dunedin should end at 2am. But all this has spurred a big reaction from local bar owners, who believe bars will be driven out of business, especially the student haunts. About three-quarters of the nearly 4300 submissions are against the alcohol plan - more than in any other city so far. Only about 13 per cent of submitters support it. Inner-city bar owner Richard Newcombe said that is because the council hasn’t done its homework. The contrast with Wellington is interesting: here, Council has proposed a 5 am closing time - an hour later than the default 4 am time that obtains in the absence of a specified local closing time. I love that I've moved to one of New Zealand's more liberal cities, even if my bedtime tends to be much earlier than either of those times. In Dunedin, it looks like the Police are pushing most of the restrictions, and that Council just gave the Police what they asked for. The Police also have objected to Wellington Council's more liberal regime. I served as expert witness for the Hospitality Association in Wellington, reviewing and assessing the literature around the effects of pub closing times; I'll blog more on that when Wellington's LAP decision comes out. It will be interesting to watch whether the LAPs have any effect on student numbers across the different Universities. Andrew Coyne thinks voting should be mandatory in Canada*; Dylan Matthews makes a similar argument for America. The best argument for compulsory voting, Coyne's, is that it could shift politicians away from campaigns based on getting out the vote: if everyone has to vote, then GOTV matters less, as does playing to the party's base. While that's one notch in favour of compulsory voting, there are a few considerations against it that might give us pause. Blood donation is almost entirely a public good. Were we to implement a mandatory blood donation regime, we would have to couple it with a tick-box allowing "donors" to indicate that their blood probably shouldn't be used or at least should undergo heavier screening: a Hepatitis B patient's blood probably shouldn't enter into general circulation. But nobody seems to worry much about the quality of a compelled vote. They should. Jason Brennan makes a pretty convincing argument that while none of us have a positive duty to vote, those choosing to vote have a duty to vote well: to weigh seriously whether the policies offered up by the different parties would achieve the ends that the voter wishes and that the trade-offs are worthwhile, in the voter's estimation. While few voters meet that duty, things are even worse among current non-voters: non-voters, on average, aren't made up of rational calculators and conscientious objectors like me; most non-voters instead have little political knowledge and little intention of acquiring any. And forcing them to vote does not encourage them to acquire more information. I'll offer instead a compromise position: make voting compulsory, but also implement a simple quiz at the ballot box. Voters would need to be able to match parties with their main supported policies. They'd also be quizzed on a few basics, like which parties formed the prior government, whether crime rates increased or decreased over the prior administration, whether income inequality has been increasing or decreasing, whether most climate scientists agree that the planet has been warming, and order-of-magnitude level quizzes on the composition of the budget. The quiz questions would vary election to election but would hit on the baseline matters necessary for understanding the policy issues at stake in that year's election. Everyone's vote counts for at least 1, but we could award bonus votes for voting well. Everyone would have the opportunity to vote well: Elections NZ would put up the 50-or-so quiz questions and their answers; each voter might get a random draw of 10 at the ballot box. Those compelled to vote but unable to vote well would have less opportunity to do harm to their own interests with their vote. I won't go all the way to nudge-based voting, but we could at least avoid some harm with this version. Think of the incentive effects. GOTV campaigns would be focused on informing supporters about basic facts so that the party's supporters' votes might count for more. I could support compulsory voting if it came with this kind of mechanism. Or we could keep things voluntary. * And see his prior similar argument here. I've been annoyed about New Zealand's film classification regime for a while. I hadn't considered the copyright and licensing angle on it. Recall that New Zealand generally runs a free parallel importation regime. If some brand wishes to enter into restrictive licensing arrangements for retail distribution, the New Zealand government generally sees no reason that it should go about enforcing those deals where they restrict Kiwis' access to imports. So if some retailer is the only officially licensed supplier of a brand of shoes, The Warehouse can still import a container load of them for sale in their stores. The producer can punish the wholesaler who sold the the shoes to The Warehouse, but there's no recourse in the New Zealand courts. Parallel importation is legal. There is a carve-out in which you cannot parallel import films for nine months after the films' first release anywhere in the world, to give some time for the theatres to have a go, but otherwise things are open. Here's MED's FAQ. Now recall further that the folks with local distribution rights are mightily annoyed with parallel importation. And the film distribution companies that sell rights to Netflix prefer being able to engage in pretty serious geographical market segmentation. Where Kiwis can pretend to be American through use of ISP global modes, or Hola!, or any of the various other VPN arrangements, geographic market segmentation breaks down. New Zealand's censorship regime then gives an end-run around parallel importation: you can't legally import a film that hasn't been classified here and you can't distribute one that doesn't have the New Zealand film classification. Having the US one isn't good enough. Where some NZ ISPs advertise a global mode that facilitates subscribing to Netflix, the Censor's Office reckons they're complicit in helping the importation of films that haven't been rated. I would have thought that 122 (3)(b) and 122 (4)(b) meant that ISPs couldn't be liable, but I'm not a lawyer. And so it's all rather interesting that The Film and Video Labelling Body has weighed in on the Censor's Office's legal run against Slingshot and Orcon. The Film and Video Labelling Body, an incorporated society whose members include the likes of Sony, Universal, Paramount, Spark and The Warehouse, does most of the legwork involved in issuing labels to non-R-rated films. Operations manager Sharon Rhodes said it expressed concern to the Office of Film and Literature Classification about online services bypassing the New Zealand labelling system early this year, but had not specifically mentioned Slingshot or GlobalMode. Spark, which launched online television service Lightbox in September, had raised concerns with the labelling body last year, she said. "I brought it up at our annual meeting in May and members were pleased to see it was something we were looking into." Rhodes said she agreed with the chief censor's view that Slingshot had breached the Films, Videos and Publications Classification Act by offering GlobalMode as a means for New Zealanders to access services such as Netflix. The cleanest solution? Fix the law so that a New Zealand classification is no longer required. Require instead that films carry the rating of any country's classification office from some list of countries whose classification decisions generally seem to make sense, or that tend to correlate strongly with New Zealand's prior decisions. It makes no kind of sense that a small country should re-classify every movie for the New Zealand market; we should be relying on others' work here. Simon Collins at The Herald reports on some problems in Suzanne Snively's estimates of the social costs of domestic violence. Sir Owen Glenn's family violence inquiry has stumbled again, producing a $7 billion estimated cost of family violence based on the mis-reading of a key research paper. A report by economist Suzanne Snively and Wellington theatre student Sherilee Kahui, published by the inquiry yesterday, said family violence cost New Zealand between $4.1 billion and $7 billion a year - up from Ms Snively's last estimate in 1994 of just $1 billion. It looks like they attributed the full high-end costs to the greater number of people experiencing more moderate forms of abuse. This isn't to diminish that experience, but there are gradations of experience and gradations of cost. Inquiry spokeswoman Marie McNicholas declined to comment on the latest mistake and referred questions to Ms Snively. Ms Snively said the data was prepared by Ms Kahui. Ms Kahui said the $7 billion "high-end" figure was not in an early version of the study, which initially included only the "low-end" estimate of $4.1 billion and what is now described as a "moderate scenario" of $4.5 billion. The high-end estimate was added after experts in Auckland and Wellington said they believed the true domestic violence victimisation rates were higher than the "moderate scenario" rates of 18.2 per cent for women and 1.9 per cent for men. "We were struggling to find empirical evidence of an estimate that would be higher than 18.2 per cent," Ms Kahui said. "So it was about finding something higher." Jeepers. Kudos to Ms. Kahui for pointing out that there was a quest to find a big number. I note that Suzanne Snively also authored the PWC report on Adult and Continuing Education that estimated very large benefits from Adult and Continuing Education by assuming that anybody taking a night cooking course would be 50% less likely to commit any crime. Congrats too to Simon Collins for catching this. I didn't have time to look through the report yesterday when I saw the big number floating around; nice to see that others have started sniffing out this stuff. New Zealand's chief censor has a bizarre view of "informed choices". “As chief censor I have previously expressed the view that games, in the legislation, should be treated the same as films. Informed choices. That sounds wonderful and nice. I wish that I could, when my children turn 12, make an informed choice to play games rated R13 with them, if they're ready. But the Chief Censor, by choosing R13 instead of RP13, makes it illegal for me to make that informed choice. Can anyone give a person under 13 years old permission to watch a R13? No. Parents, caregivers or teachers cannot give permission for under 13s to watch or play R13 films or games. If a teacher or community group wants to show an R13 film to people under 13, they will need to apply to the Chief Censor for an exemption from the R13 classification under section 44 of the Films, Videos, and Publications Classification Act 1993. This isn't about informed choice. It's about the Chief Censor taking away parents' choices. Currently, game manufacturers need only submit games restricted in Australia or the UK; the Censor worries that too many of these are sold online by Steam, and others, without NZ classification. I worry rather that the Censor takes away far too many of our freedoms already by banning us from playing games with our kids instead of just warning us that we might want to pay particular attention to some of these games before launching into a gaming session. Anna Pearson reports on teenagers' drinking, with lots of anecdotes from kids who like getting drunk. Unfortunately, the story's a bit weak on data. The Ministry of Health showed reduced youth drinking participation, slight reductions in overall hazardous drinking among past-year drinkers but more substantial reductions in hazardous drinking among youths who were past-year drinkers. The MoH data is here; I'd summarised here. The main figures are copied below. 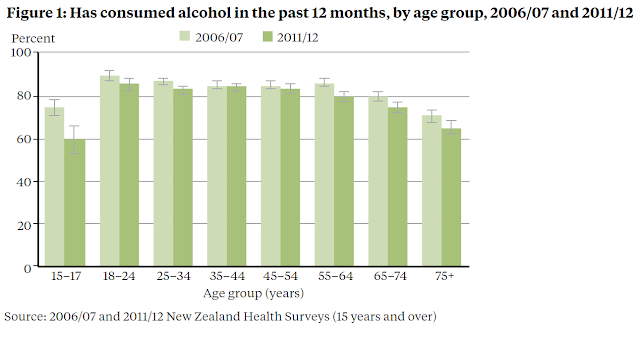 The Auckland Youth '12 Survey also showed decreases in binge drinking, for both genders, from 2001 through 2012. I'm curious to know which study she's referring to. It's possibly the SHORE data that showed an increase from '95 to 2000, then flatlining since then, but it would be pretty misleading to put up the two dates and invite readers to infer a continuously increasing trend through the two data points. Maybe some new data is out that I don't know about. If there is, wouldn't it have been nice to put up the official MoH data that kinda shows the opposite? 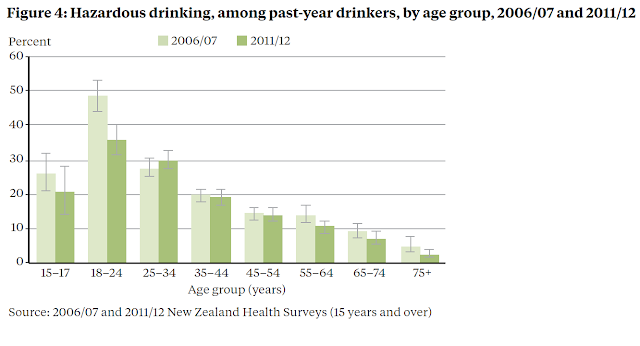 Update: Anna reports the Women and Alcohol in Aotearoa Report as source on that stat. I'd hit that one here; it cites the Casswell 2012 unpublished presentation to the From Harm to Harmony conference as source. I agree with James Kirkup that the economic benefits of immigration are unlikely to be decisive in convincing anybody about the merits of immigration. But where we hear endless populist appeals to the economic costs of immigrants, and where those stories are convincing for some, isn't a little shouting warranted? The economic benefits of immigration are only part of the case for a liberal immigration regime. But they're important where we otherwise hear a lot about how immigrants impose net costs. If the government makes company directors personally liable for criminal charges if they've not exercised sufficient due diligence around employee health and safety risk, should we act all surprised when companies start deciding that a lot of things are too risky? Having already released a Guideline document for Directors on managing health and safety risks [Good Governance Practices Guideline for Managing Health and Safety Risks ] the government has now released an Exposure Draft for the proposed new legislation, expected to replace the Health and Safety in Employment Act 1992 sometime in 2014. The Exposure Draft contains a raft of wide-ranging reforms. However, the purpose of this article is narrow; to look at the new Directors’ obligations under the proposed legislation. The new Health and Safety at Work Act will impose an active duty on those in a governance role to proactively manage workplace health and safety. Under the present legislation, the Directors of a company can only be held liable for a breach of the Act where they have participated in, contributed to, or acquiesced in their company’s failure. The new laws will impose a due diligence role on Directors with regard to health and safety. What happens if an Officer doesn’t meet the obligations? An Officer of a PCBU can be convicted of a failure to meet the due diligence requirements whether or not the PCBU has also been convicted of an offence. However, if an Officer hasn’t met his or her specific duty, chances are pretty good that the PCBU itself has also fallen down somewhere along the line. Consequently, a Director of a business could be facing liability in respect of his or her Officers’ duties, as well as the business facing liability as a PCBU in relation to the same event. Is it any surprise that Solid Energy reckons that Pike River still isn't safe enough to enter? Kevin Hague is likely right to point to personal liability as a potential issue; I wouldn't follow him in characterising this as putting commercial interests ahead of grieving families though. It is heroic to require corporate directors to assume heavy personal liability including up to five years' imprisonment if their due diligence on entry risk wasn't 100% up to spec, under a new incoming legal liability regime with great uncertainty about potential application. One wonders what other risky, but efficient, actions might be deterred under the new regime. In The Matrix, the robots stuck humans in a synthetic 1990s. They could have given us paradise, but they found we rejected it: we couldn't deal with things being too good. And so the 90s it was: Pretty good, but not quite paradise. ...Like the proverbial dog chasing a car, humans want paradise but don’t know how to live when they find it, so we invent or adopt problems to keep us happy. When this mind-set is scaled up to the level of the nation state, some funny things start happening. ...This is where the prime minister’s incoherent debate about fighting in Iraq converges with the inability of New Zealanders to enjoy the fortune of living in a paradise. We go out of our way to embrace other dilemmas to fill the void of having nothing to fight against because there’s clearly something so existentially frightening about living in a society that’s as close to paradise as humans have ever come. I reprised paternalism and public health in a column at Werewolf; I'm to be contributing a column there on an ongoing basis. Read the whole thing; here's a snippet. The Commerce Building at the University of Canterbury was heavily damaged in the February 2011 earthquakes. The three buildings making up the Commerce Building bashed against each other, requiring substantial remediation. The University then spent a long time in court with its insurer: the Council required that buildings be remediated to 66% of code, rather than the 33% that obtained pre-quake, but the insurer (not unreasonably) deemed that to be a betterment. The University of Canterbury is going to the Supreme Court to appeal a decision on the level to which a damaged building must be repaired. A High Court judgement earlier this year said the council had been wrong to make higher seismic strength standards part of the consent process for repairing damaged buildings. It stated the council can't expect buildings to be repaired to anything higher than 34 percent of the New Building Standard. Canterbury University appealed that ruling, arguing it would save more than $140 million if it could say to its insurers that the council required all of its 240 damaged buildings be repaired to 67 percent. An appeal will be heard in the Supreme Court on November 11. I can understand the University's argument for repairs that have already been undertaken: Council was requiring a higher standard, and the University had to make repairs under the Council's rules at that time. The argument does get a bit strange if applied to repairs that have yet to be undertaken, like those for the Commerce Building, which I don't believe had started when I left there in July. Wellington's scariest building remains Wellington's scariest building. Last year, the Environment Court denied Mark Dunajtschik permission to tear down the Category 1 listed Harcourts Building. He was also under order either to make the building safe or tear it down. His planned strategy for making the building safe, which involved maintaining the look of the building but not the specific materials currently there, would have improved safety and would have been cost-effective; the heritage people said it wasn't good enough and that he consequently needed to use a repair strategy that did more to preserve specific heritage construction methods and materials. Dunajtschik said the proposed repair strategy was entirely unaffordable given the tenancies the building could attract even after strengthening. The High Court batted it back to the Environment Court, saying that the Environment Court erred in placing too little weight on economic considerations. I, and others, read this as a bit of a rebuke to the Environment Court and that the Environment Court needed to pull its head in. Instead, the Environment Court has affirmed its prior decision. In a decision released this weekend, Environment Judge Jeff Smith said public safety and the risk to the neighbouring HSBC tower could be protected by measures other than demolition of the heritage building, such as strengthening. "We have concluded that alternative [of repair] is reasonable, although we cannot compel that outcome on this appeal. However, neither will granting a demolition consent compel the owner to demolish the building." The findings noted if local government considered a building a danger to public safety, it had powers to require that building to be repaired. Smith's being a bit silly here as Dunajtschik very obviously wishes to bulldoze the building. The Harcourts Building sits next to the HSBC Building, both are owned by Dunajtschik, and the Harcourts Building would do terrible damage to the HSBC Building in an earthquake: they'd thump together and knock out the HSBC Building's stairwell. As the neighbouring HSBC tower threatened by the un-strengthened Harcourts site was also owned by Dunajtschik, "the economic argument against strengthening the Harcourts building looks even more tenuous", the ruling said. Because Dunajtschik risks losing tenants in the HSBC Building if he does not make safe the Harcourts Building, the Court is betting that Dunajtschik will comply with Council's order to make the building safe via a repair strategy that is uneconomical when considered only with respect to the Harcourts Building but perhaps economical if the total value at risk isn't just the Harcourts Building but rather both buildings. The Court is also betting that there won't be a big earthquake between now and this mess's being sorted out. Council and the Court, by requiring that the building be made safe and follow gold-plated Herittage standards, can extract not the entire value of the Harcourts Building but also the entire value of adjacent affected properties that are under the same ownership. The magnitude of potential regulatory takings in Heritage cases is non-trivial.